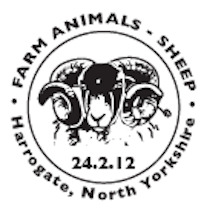 Pictorial Faststamps: Sheep - 24 February 2012 - Norvic Philatelics. 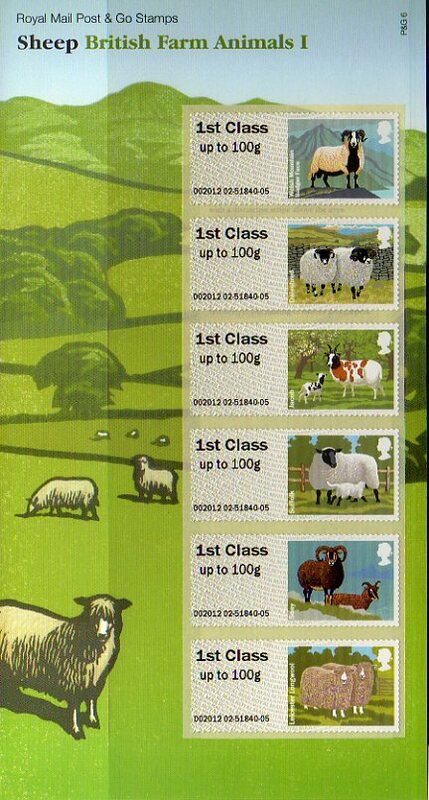 Royal Mail is going down on the farm in 2012 with its new series of Post and Go stamps. 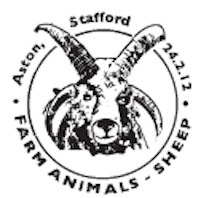 British Farm Animals is the first in a series of three issues that will explore some of the many traditional breeds of sheep, cattle and pigs to be found on farms in the UK. Post & Go terminals allow customers to weigh their letters and packets, pay for and print postage labels and stamps without the need to visit the counter. The first Post & Go machine was trialled in The Galleries Post Office® in Bristol in 2008. The labels can be obtained with 6 different service indicators from all machines: 1st class up to 100g & 1st class Large up to 100g, Europe up to 20g, Worldwide up to 10g and 20g, and the new Worldwide 40g. The stamps are dispensed singly or in strips of up to 5 of the same value or various values. Thus there are 30/36 different value/design combinations in total. A collector set of 6 in two strips of 3 are also available. This ancient breed is mentioned in the Domesday Book. There are two varieties: Torddu (Welsh for black belly) and Torwen (white belly). The Torddu’s colours vary from white to light brown with a distinctive stripe above the eyes. Distinguished by its black face with a white spot on each side of its nose, this hardy sheep has been bred in northern areas of England for generations. Its tough hard-wearing wool is favoured in the making of tweeds and carpets. The Jacob originated in Syria over 3000 years ago. With its distinctive spotted fleece and eye-catching horns, the Jacob was introduced to the UK as an ornamental breed. The strength and length of the wool (up to 10cm) make it ideal for hand spinning. Its all-black head, legs and almost horizontal ears make the Suffolk a particularly attractive breed of sheep. Created from crossing the Southdown and the Norfolk Horn, its beautiful fleece produces fine knitting wools and tweed. Originating from the first domesticated sheep that populated northern Europe, the Soay is the UK’s most primitive sheep breed. Small and robust with curved, ridged horns, it has a fleece usually chocolate or tan in colour. A large breed of sheep with a curly white fleece, the Leicester Longwool was developed by Robert Bakewell over 200 years ago. Its quality wool is in demand by hand weavers and is mainly used to create fine cloth, suiting and knitting wool. The pack available from the Philatelic Bureau and some post offices will be changed from the Birds format with the stamps being printed not by Walsall Security Print in horizontal rolls but from the Hytech machines of the style previously used at Stampex. Thus the pack will contain a vertical strip of 6 x 1st. The publicity image of the strip and the pack have the Soay breed at the top, but removing the stamps reveals that the description shows the Welsh Mountain Badger Face at the top, and this is the intended order. Unfortunately Royal Mail seem to have omitted to remind Hytech of this! Whilst all our dealer stock was 'correct', it seems that many ordinary collectors getting the packs on Bureau standing orders had a variety of other versions. See the blog for more details and illustrations. Designed by Kate Stephens and illustrated by Robert Gillmor the six 56mm x 25mm stamps are printed in gravure by Walsall Security Printers, with two phosphor bars. The stamps in the pack will have the service indicator and other detail printed in gravure. All images are by kind permission of Royal Mail, Copyright 2011/2. This website is copyright Norvic Philatelics 2011/2. The labels will be used in Post & Go machines at Post Offices around the country - see the list on the postagelabelsuk blog. A mint set was sold in a pack similar to a presentation pack. All values in the pack are 1st Class with a philatelic branch code of 002012. The Packs should have strips of stamps with the Welsh Badgerface at the top, to line up with the desciption printed in the pack. 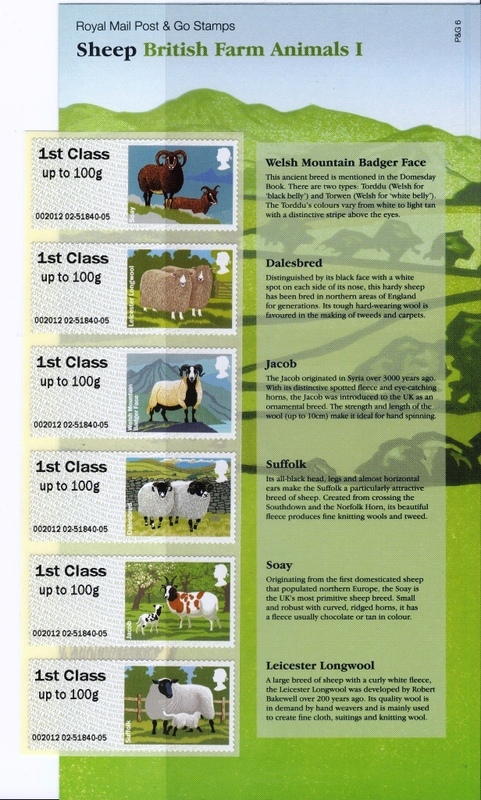 Packs have been found with the strip of stamps miscut so that the Soay (as shown above), the Suffolk, and the Dalesbred stamps at the top of the strip. All the stamps are in the correct order. Although Post & Go machines are a Post Office Ltd product, Royal Mail will again produce a First Day Cover and official First Day Postmarks for these. Postmarks available for the day of issue are shown here, others may be added later. These are not to scale. These postmarks cannot be obtained after the date of issue. If you wish to be told when this page is updated, please use the ChangeDetection box at the top of this page. NB: all emails will be acknowledged in 1-2 days unless we are away (see home page). If you do not receive an acknowledgement please email us from a different address (eg hotmail, gmail).